I really love pasta; pasta of all kinds. 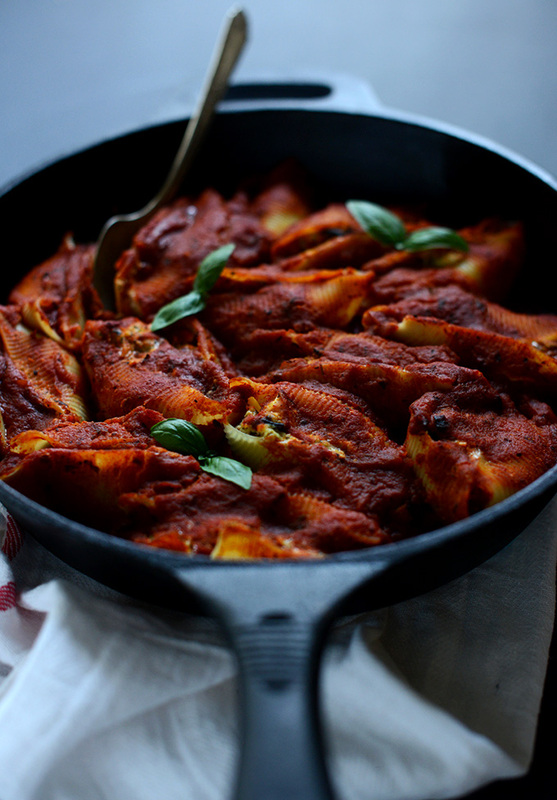 Fettuccine happens to be my favorite but stuffed shells take a close second. As of late, however, dairy has been bothering my system more than usual so I’m currently experimenting with new recipes that keep cheese and other dairy products at bay. Easier said than done. These shells were my first attempt and they came out a supreme success. I actually just had the leftovers for lunch and grinned the whole time I shoveled them in. I couldn’t believe how rich and satisfying they were with no cheese. Bonus: I couldn’t even detect tofu. Win! That’s it! 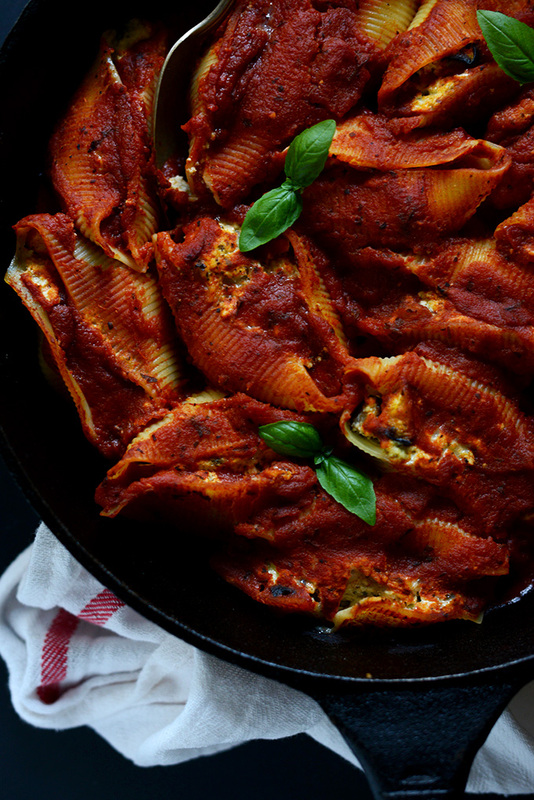 All that’s left is the shells and red sauce, making this an 8-ingredient meal that only takes 1 hour from start to finish. 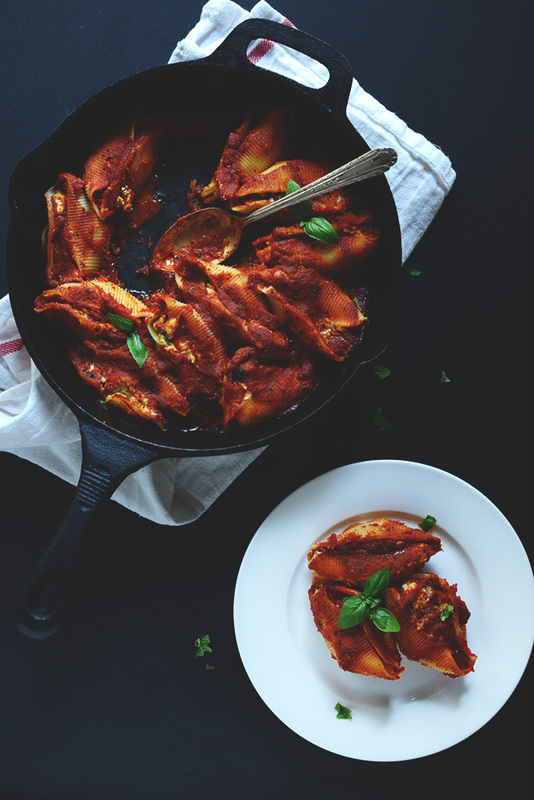 If you’ve never tried eggplant in Italian dishes, you’ve been missing out. 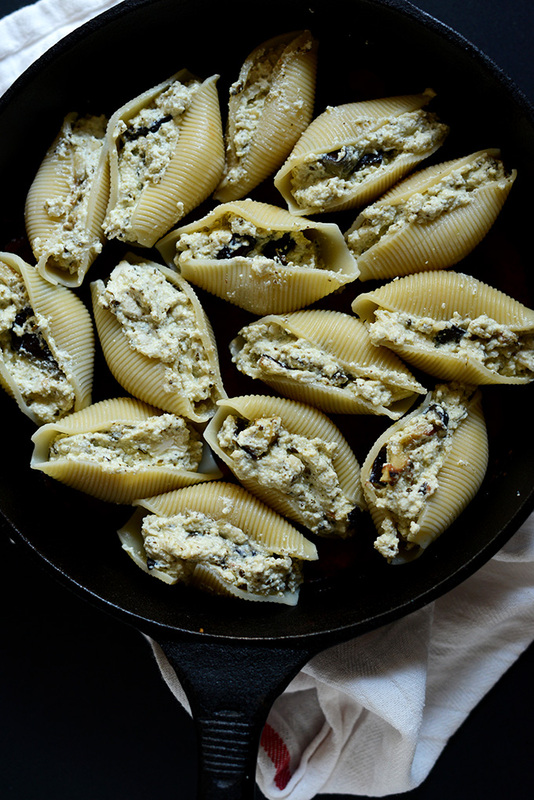 The roasted eggplant pieces in the filling kind of make these shells. Doused in tomato sauce it’s like heaven on a fork. John even tried these and said he probably wouldn’t have been able to tell the difference between these and normal stuffed shells had I not told him. That’s a HUGE win in my book because he’s not a huge fan of tofu (nor am I). Thankfully, these shells passed the test and will definitely be taking the place of cheesy versions from here on out. My stomach couldn’t be more thrilled either. 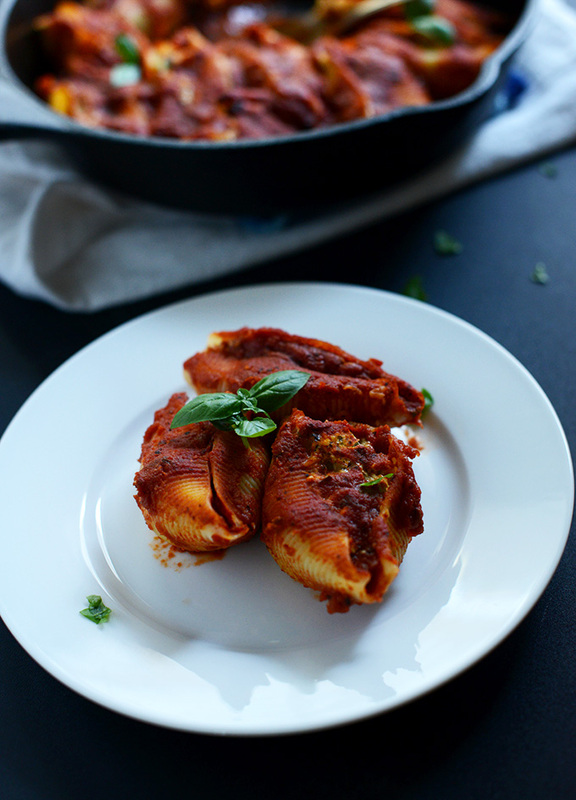 Simple stuffed shells with a dairy-free tofu-eggplant-pesto filling. 8 ingredients, vegan, and so delicious. Next, bring a pot of water to a boil and add shells and a pinch of sea salt. Stir once and cook according to package instructions. Also, preheat oven to 375 degrees F (190 C). Once the shells are done, drain and let cool slightly. 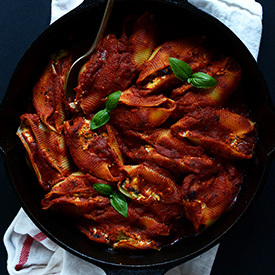 Pour 1/2 cup red sauce in the bottom of a 10-inch cast iron or 8×8 pan (amounts as original recipe is written // adjust if altering batch size), then stuff shells with generous spoonfuls of filling. *If you’re not a fan of dairy-free “cheese,” simply leave it out and sub it with more eggplant or tofu. *If not vegan, you can add an egg for extra binding while breaking down the tofu in food processor. This is not necessary though. Made this using the “5-Ingredient Vegan Almond Ricotta” recipe (replacing the almonds with cashews because it was all I had) and it was delicious. Quite time consuming but I did opt for making my own marinara too, it was all worth it regardless and I’m looking forward to the leftovers I have tomorrow. I love many of your recipes but these exceeded my expectations! I added a bit of nut parm to the filling. I was surprised that it didn’t taste like tofu. Will definitely make again! Hi Dana! Can I make this and the eggplant rollups with the macadamia ricotta from your 8 ingredient vegan lasagna recipe? Just finished eating these! They are even better than I thought they would be. Thank you so much! Hi! It wouldn’t work well, we recommend serving immediately! Hi! Do you roast the eggplant on the top rack and on high or low broil? Is it better to roast them on regular heat for longer? These were amazing! I will be making these again for certain. The filling was creamy and the eggplant gave it a wonderful texture and added delicious flavor. Also, it was so easy to make! Are you peeling the eggplant or leaving the skin on. Leaving it on, but you could peel it if you want. To date this dish has been the biggest hit with the family. I felt guilty after eating because it tasted like real cheese filling. It was relieving to know it’s actually good for me! This will definitely be in my rotation of meals. Thank you for all of the great recipes!! I’ve been cooking from your recipes for over a month now without disappointment. Wow!!! This was another home run, nay, grand slam!! I had this lovely very first little eggplant in my garden and the timing of getting this recipe was perfect. Super duper easy. Made a vegan pesto with almonds cuz that’s what I had. And I didn’t use the cheez shreds. It was delicious, satisfying in that homey pasta way, but felt so light. I’m so grateful for you and these wonderful recipes. ???????? I have made this 3 times and it’s delicious! I make my vegan cheese with nutritional yeast.. and sometimes I top it with some sprinkled parmesan since I do eat dairy. I use ready made arrabbiata sauce on top! ALSO A warning to all the vegans though, keep an eye out for Go Veggie ingredients. They tout as “dairy free”, but they are not vegan. Most of their products contain casein. Question: if I add ricotta? 1. Bring Pot of water to a boil and add noodles. While noodles cook according to package instructions, blend mozzarella ingredients in blender until smooth. Pour into a small pot and cook on medium heat until it thickens. Stir frequently. Place thickened cheese in fridge and let cool at least 15 min. Pre-heat oven to 375. 2. While mozzarella cools, process parmesan ingredients in food processor until it resembles fine crumbs. 3. Drain cooked noodles and let cool. 4. Cover the bottom of an 8×8 baking pan with a layer of pasta sauce. 5. Add tofu, spinach, and mozzarella to the processor with the parmesan. Process until well-combined. Processing for a longer period of time will make the tofu flavor less noticeable, but be careful to not let it get soupy. This was incredible! Followed the recipe to a T and we loved it. Thanks for sharing! I can’t do tofu. Any other options? I want to make this but can’t do soy. Any suggestions would be great. Is basil pesto in most supermarkets? What can I substitute? You can make your own pesto, but yes, I find it in most supermarkets. Ooh I’m looking for tasty vegan pasta dishes at the moment and this has just jumped to the top! Love the roasted eggplant in there, my absolute fave. This recipe makes me so happy. I love cheesy pasta dishes but have had to eliminate most all dairy. I am really excited to be able to try this. 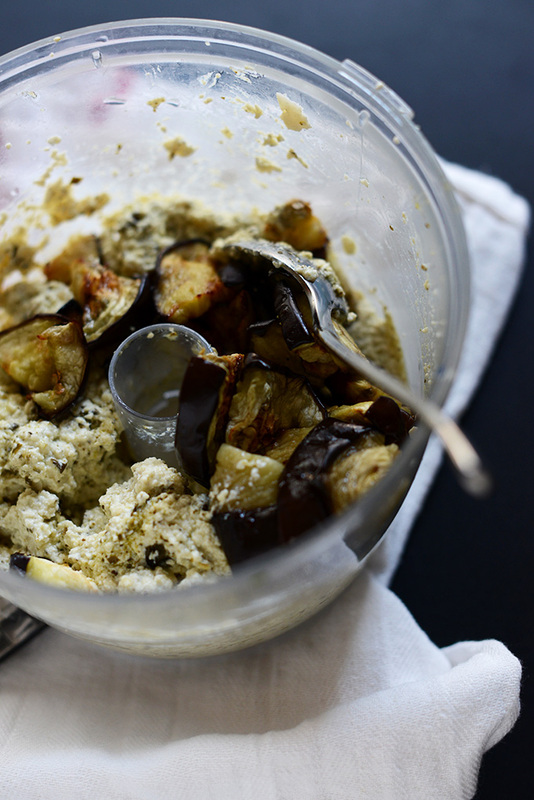 I have a question though – do you have a cheese free pesto recipe you use? I know there isn’t a ton of Parmesan in pesto but still, regular pesto isn’t vegan. Thanks! Yes! It’s just one I got from my grocery that’s cheese-free. Otherwise you can just omit it and add more pine nuts when making it yourself. Hope that helps, Laura! Dana – I finally had a chance to make these and they were incredible! 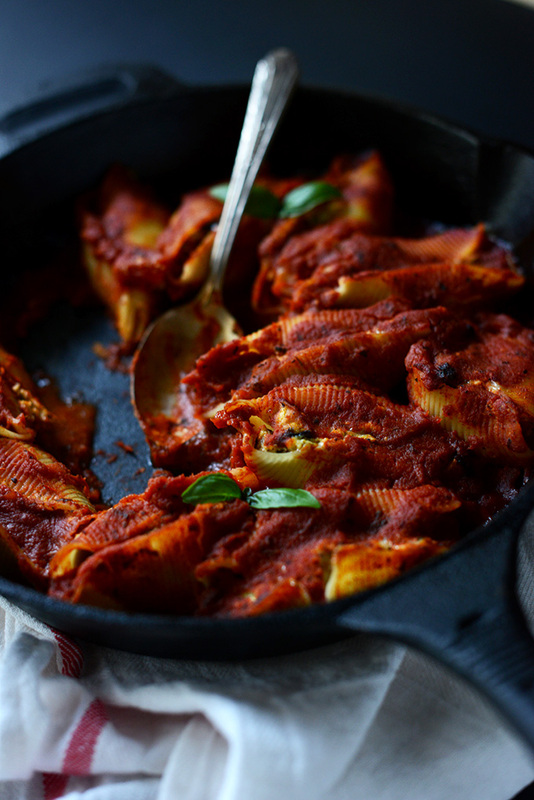 Roasted eggplant on anything sounds amazing, let alone whirled and stuffed into shells! Yum! These sound delicious and your photos are gorgeous too. That vibrant red sauce really pops! I’m going to give these a try. Dairy sits just fine with me, but it certainly doesn’t hurt to go without from time to time. I actually things taste better without cheese. Cheese has such a strong, overpowering flavor that once you get it out of the way you can actually taste the stuff underneath. But that’s just my opinion. 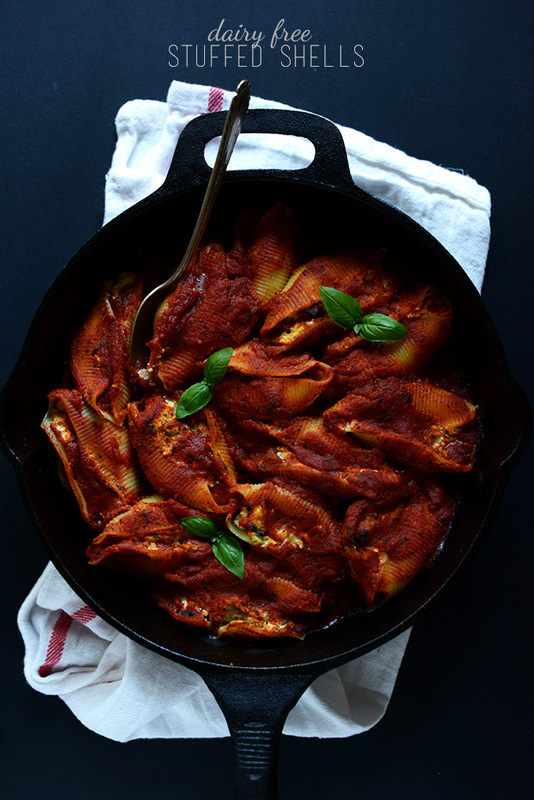 My favorite stuffed shells ever are jenna’s dairy free stuffed shells w/ tofu & spinach. I think it’s way better than ricotta. I’d totally try these, minus the fake cheese. Do you think they’d be fine without the “cheese”? Yes! Just omit it and add more eggplant and/or tofu. 0what a great recipe – all the cosy Italian warmth of baked pasta, without the huge dairy bomb of the original. 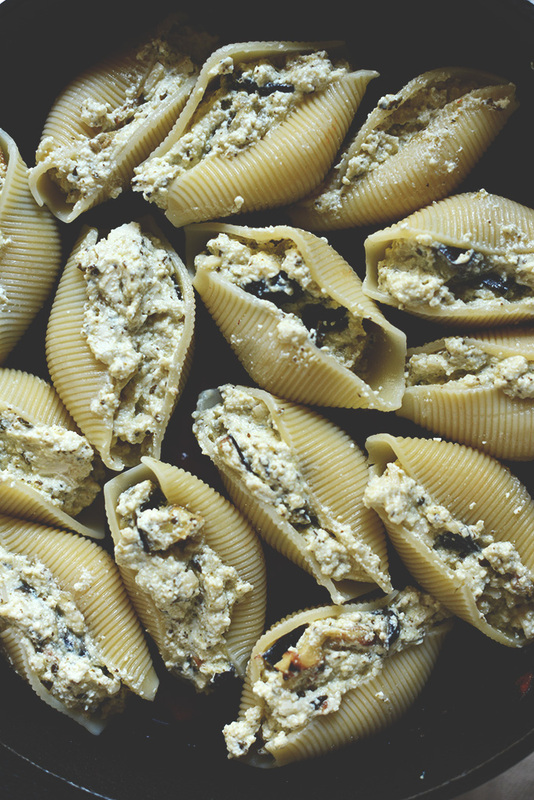 Stuffing shells with eggplant is such a cool idea! Love this!